Let me tell you about my wife, April. She is a young woman who stole my heart and forever changed my life. She is a mother with just enough energy to chase after our supercharged toddler. She enjoys teaching High School English where she is a natural mentor to teens even long after they’ve left her classroom. She also has a passion for capturing the essence of friends through portrait photography and a deep faith that ties it all together. 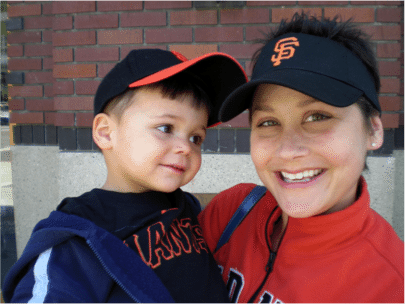 In late 2010, what seemed to be a stubborn nasal infection turned out to be a rare and aggressive form of cancer – Rhabdomyosarcoma. After more than a year of intense chemotherapy, radiation, and frequent hospital stays she was in the clear, only to have the cancer return two short months later. That was followed by surgery and more radiation but the cancer just spread to other parts of her body. The doctors could only offer more chemo in hopes of keeping this disease at bay. This did not sit well with April; she rejected the notion that she would have to live a life with chronic cancer and have to endure constant treatment. She’s only thirty-seven and she has a family that needs her. April’s strong will and faith that God has a plan put her on a path to seek a second opinion. In doing so, April found a doctor that was willing to see her. He runs a Sarcoma clinic and was starting a new clinical trial. April was lucky enough to get the last spot available for the trial. While April and I are thrilled at the opportunity to be a part of the trial and the hope it represents, we were not sure how we could make it work financially. Our heads were swimming with questions. How can we get our insurance to pay for this? How can we afford plane tickets to and from the Bay Area and Los Angeles every week, along with hotel expenses, taxi fares, etc.? Would we have to move? Before leaving Dr. Chawla’s office, we were told about Lazarex Cancer Foundation, a charitable foundation that helps by providing assistance with costs associated with clinical trials. Lazarex has been a God send; they have assisted us with the expenses of traveling to and from the trial on a weekly basis. We couldn’t have done it without the support of Lazarex and our family, friends and the community. Now that April is entering a third year of near continuous treatments it is exhausting and overwhelming. We are appreciative of the good people in our lives and continue to believe that God’s path for April is to fight and beat this disease.